Dezeen Watch Store visits New York this week: a selection of our most popular watches are on sale at the WantedDesign pop-up store from tomorrow until Monday 16 May. 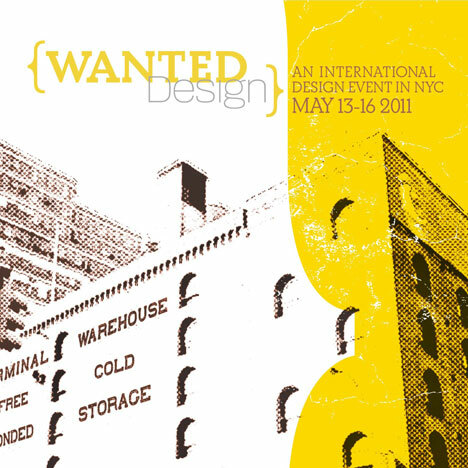 WantedDesign is a new event taking place at La Venue, Terminal Store, 11th Avenue & 28th Street. Dezeen Watch Store will present bestsellers from our collection including the Uniform Wares 100 series (above) and the VOID V02 (below). May 15, 4:00-4:45 pm: Introduction/Presentation of the Expotential Project (ten urban interventions/ten design labs) presented by Laetitia Wolff (futureflair). Year after year, Design Week blossoms in NYC in May, at the time of the ICFF (International Contemporary Furniture Fair). This year, we are happy to launch an exclusive design event for the industry, the visitors and the city of New York: WantedDesign NYC, in a special place and format reflecting what New York is about: multi-cultural, provocative, contrasted, innovative, full of energy and talent. WantedDesign’s goal is to build year after year a creative platform bringing together international designers, architects, interior designers, craftsmen, editors, manufacturers, curators and communication specialists to showcase, share and discuss inspiring and innovative design. These 3 days of non stop design events include: A balanced and harmonious selection of well established companies’ newest products as well as designer prototypes and the launch of a new furniture label, from the US, France or New Zealand. A series of craftsmen workshops combined with live demonstrations of the latest design technologies. A series of conversations to share, question, discuss design topics with the main actors of the design and architecture scene. You are invited to join this beautiful and convivial New York space for the first edition of WantedDesign, for three days of viewings, happenings, workshops and conversations! • May14, 5:00pm-6:30pm: “Synergies between Architecture and Furniture”, with Jacques Ferrier ( Jacques Ferrier architectures), Dominique Gonfard (Lerival), Matilda McQuaid (Cooper Hewitt National design Museum), Dror Benshetrit (StudioDror) , Winka Dubbeldam (archi-tectonics nyc), Marc Thorpe (Third Eye Studios). • May 15, 5:00 pm - 6:30 pm: “The new generation of designers”, with Dwell Editor in chief, Sam Grawe, Rama Chorpash (Parsons School of Design), Antoine Roset (Ligne Roset USA), Francois Brument, Todd Bracher, Brad Ascalon, Philippe Nigro. • May 16, 5:00 pm - 6:30 pm: “Cultural impact on design”, with Jaime Odabachian, David Trubridge, Matali Crasset, Frederick McSwain, Giulio Cappellini (Cappellini), Joe Doucet (Joe Doucet studio). During the 3 days, a few of the finest craftsmen working with metal, wood, engraving, or gilding will collaborate on site, with designers to create a one of a kind piece, to be revealed on Monday night at the end of the event. Coordination by Julien Legeard (Excellence Group), with the participation of LMC Corp (Les Metalliers Champenois), Gohard Gilding, Ateliers Jean Joseph,Santo et Jean Ya and designers Marc Thorpe (Third Eye Studios) and Brooks Atwood (POD- design founder, Assistant Professor at NJIT). Few “designers meet craftsmen” times will be announced during the 3 days with special guests. French designer Francois Brument will demonstrate and share with the visitors the result of his most recent researches using new software to interact with human movement and lights. Café: Sponsored by Fermob, La Colombe Torréfaction coffee, Kusmi tea. Lounge: Sponsored by Bang&Olufsen and Ligne Roset. Library corner: Sponsored by Quinze&Milan. Raison Pure Design Group, Open Skies, Cultural Services of the French Embassy / Institut Francais/Maison Francaise, Ikon photo, Appia Spa, Aquaovo, Steelspace. Friends of WantedDesign: Cooper Hewitt National Design Museum, Classic Car Club, futureflair, Brad Ascalon Studio, Matilde Alessandra, Marc Thorpe, Frederick McSwain, Intramuros, Modern magazine, MIX magazine, Dezeen, Mocoloco, Core77, White Wall. Normann Copenhagen pop up store + A curated « Wanted pop up store » ( a selection of products curated by Wanted Design, including Dezeen Watch Store).